Millhouse to Ormidale. 20 Miles. I followed the loop to the bottom of the point at Ardlamont house. and headed north again to Kames and Tighnabruaich. Jamie joined me at lunch time at Kames and we headed north again. The weather was fine and I realised as I wandered along passed Tighnabruaich that I couldnt see a path that would take around the cliffs to the north of the town. So Jamie and I had to double back and climb the steep hill towards the scenic vantage point that looks over the narrow straits that bound the island of Rothesay. It was difficult to get a mental image of where I was as the Cowal peninsula is kind of wrapped around the island. It was a pretty hot day and the flies started to bother Jamie as we pushed up the hill. Jamie also was wearing a pair of shoes that were literally falling apart which he eventually discarded at the end of the four days as the sole was flapping about on one of the shoes. 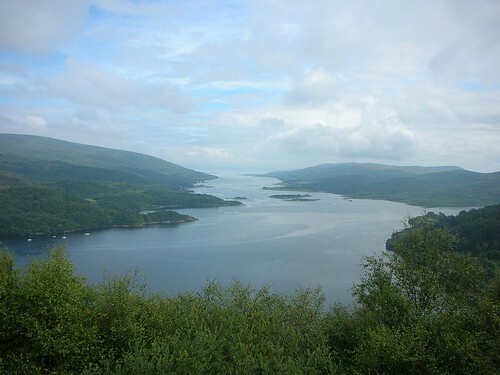 He was overjoyed when we reached the van – I decided to walk to the head of the Kyles of Bute which was only another hour or so away. You are currently browsing the Scottish Coastal Walk blog archives for the day Tuesday, July 22nd, 2008.